Vita Coco's an all-natural, super-hydrating, fat-free, cholesterol-free, nutrient-packed, potassium-stacked, mega-electrolyte coconut water! While other beverages claim to be the before, during, and after sports hydrator, we don’t. Sure, Vita Coco is stacked with potassium, and is as natural as natural gets (some say it’s like putting a straw in a coconut). Vita Coco is about hydration. And hydration is important no matter what you do. It’s okay if you’re not a marathon runner, a football player or a Tour de France winner. Life is hectic enough, and you should be hydrated while you live it. Go ahead, get hydrated and remember that life is a sport. What kind of coconuts do you use for Vita Coco? We use younger coconuts for all our beverages. The average age of the coconuts we use is seven months. What’s the different between coconut water and coconut milk? There’s a big difference between coconut water and coconut milk. Coconut water comes from inside younger coconuts filled with a clear, electrolyte-rich juice that contains zero fat and zero cholesterol. Coconut milk, on the other hand, is what is produced from grating the coconut meat of older, brown coconuts: a white, rich liquid containing oils and fat, and often used as an ingredient in cooking and baking. Do you pasteurize this product? Yes. Our machinery uses a patented method to extract the coconut water then filter and flash pasteurize the water at 120 degrees for up to five seconds, before packaging it in its aseptic Tetra Pak package. 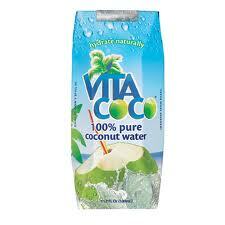 Only Tetra Pak stabilizes the coconut water and gives Vita Coco a shelf life of 12 months. Is Vita Coco gluten free and vegan-approved? It’s a big yes to both: our coconut water is gluten free and vegan-approved, as Vita Coco does not contain any animal-derived or dairy products in its beverages. Yes, Vita Coco is kosher and is Star K certified. Why does Vita Coco add natural sugar? Vita Coco’s non-flavored coconut water beverage now includes “less than 1% natural fruit sugar” on its ingredient list. This addition to the ingredient list enables Vita Coco to standardize the sweetness level of its beverages regardless of harvest, time of year, or country of origin. The beverage will continue to contain the same amount of sugar as stated on its nutritional fact panel: 11 grams per 8 oz. serving. However, depending on the sweetness of a harvest, Vita Coco adjusts the sugar level in the packaged beverage to ensure consistency of sweetness. Taste may continue to vary slightly as Vita Coco is a natural beverage made from coconuts sourced from around the world. What is the source of the “natural fruit sugar” added to Vita Coco? The fruit sugar added to Vita Coco’s non-flavored coconut water is natural and derived from fruit such as pears and apples. Vita Coco does not use corn-derived sugars.